Hedychium gardnerianum will produces striking creamy yellow flowers with red stamens during the late Summer and into Fall. After flowering the stalks die and new stalks are produced. Kahili Ginger grows best in light shade with moist well drained soil. The Kahili Ginger will grow in full sun near the coast, but requires some shade in inland gardens. Plants are normally 4-5 feet tall but can grow to 7 feet in favored conditions. For such a tropical looking plant Hedychium gardnerianum will tolerate a surprising amount of drought when planted in the ground. Some plants survived summers without supplemental water in coastal gardens. Hedychium gardnerianum will tolerate a light frost but will show the effects of it until the new shoots pop up. 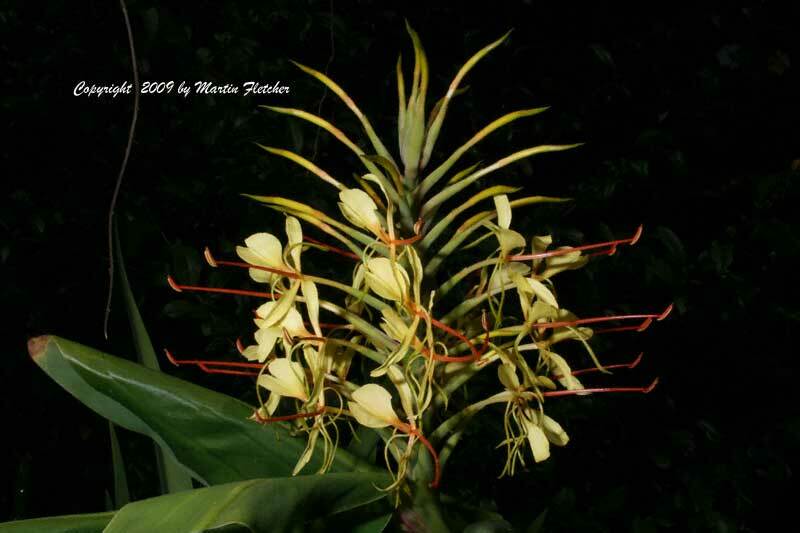 Hedychium gardnerianum plants are root hardy to 15° F.
Yellow flowers and foliage of Hedychium gardnerianum - Kahili Ginger. High resolution photos are part of our garden image collection.